This is our proposal for an effective ‘light touch’ regulator, which is very business friendly, yet maintains powerful ethical, social and ecological responsibilities. This OSGO has early responsibilities for debris control and waste management. Orbital security will come next (a minimal UN police presence); by 2050, governance over the harvesting and usage of celestial resources role will become the dominant responsibility. This may include real estate management. And it really needs your care and attention: click here! We hope that the UN (COPUOS) can reach consensus on a vital treaty update and on a suitable framework for commercial space ventures. 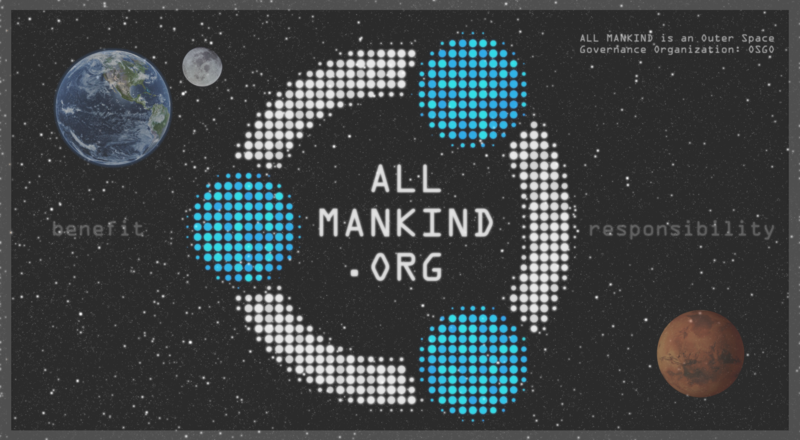 We will freely donate this internet domain (AllMankind.org) if they wish. The proposed model is already taking shape through the excellent work in The Hague: ‘The Hague International Space Resources Governance Working Group’ … the website is HERE … and the first draft framework is HERE … we like it! Our proposed model is similar, except that we make provision for individuals & companies to own actual celestial real estate. As a supranational body responsible to UNGA, the space governance council (All Mankind), will generate and issue land titles for all successful ‘First Registration’ applications. Using a common law model, the bundle of ownership rights become divided. All Mankind will retain ultimate control either through ‘right of eminent domain’ or by retaining ‘legal title’ (acting as trustee with beneficial rights going to the new ‘owner’). This is to ensure responsible development of celestial land assets. For more on the specific legal matters regarding ‘The Martians,’ click here: LEGAL MATTERS FOR MARTIANS! It’s Our Solar System! … at least we think it is … We WILL look after it. ‘All Mankind’ is our proposal: a space governance council that is both socially and environmentally responsible, yet also very business friendly. And Earth … well Earth is the BEST planet in our portfolio! … It needs maximum care after 150 years of abuse. So welcome to ‘The Province’ of ALL MANKIND! … This proposed body came about from ‘The Martians’ Project [martian land claims are equitably issued to people of every single nation!]. We hope that the ‘UN’ will take up the role of All Mankind. The next phase of human exploration into space will be bound to plans for explotatioin of celestial resourceS. In order to ensure a peaceful, respectful and ordered process, we need a modest framework. … we will need a savvy, business friendly, socially minded, governance body (with some genuine powers of regulation). But we do update FB with weekly headlines.